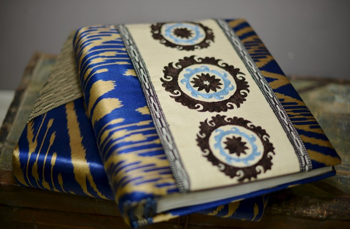 Dana Davies, Uzbek Journeys client and owner of Caravanthology, an online textile gallery and boutique, has contributed this interesting article about the Tashkent ikat studio Bibi Hanum. 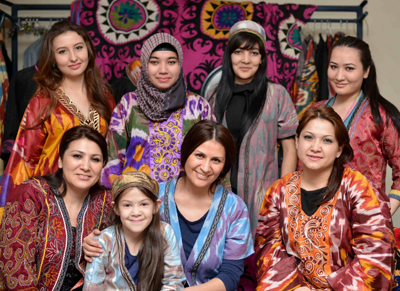 Muhayo Alliyeva, founder of the Uzbek fashion house Bibi Hanum, is one of three sisters raised in Tashkent by the father in a family that did not conform to the stereotype of the traditional Central Asian patriarchy. He was, in fact, enlightened and progressive in seeking independence for his daughters. "My father was himself well educated with diplomas from two universities and always wanted all of us to get good education". An older sister, indecisive and indifferent about education, went to seamstress school to learn tailoring skills. It was Muhayo, however, who became fascinated with her sister’s assigned projects and provided regular assistance with her homework, learning the craft at the same time. As the two worked together, neighbors took note and began ordering clothes for themselves. In the period of economic instability following the collapse of the Soviet Union, Muhayo’s father believed that learning English would be a tremendous advantage for Muhayo and did not oppose her, then 17, spending a year studying in the United States as an exchange student. At that time it was not common for a young Uzbek woman to live independently in a foreign country. Muhayo remembers when her relatives were trying to dissuade me from going, her father's response was "If she is selected among all the competitors, I will give all the support that she needs". Her study abroad exposed Muhayo to Western culture, an experience that continues to influence her worldview and design. Not long after her return to Tashkent, her father passed away. Then a turning point for her family - her two sisters opted for traditional, arranged marriages while 19 year-old Muhayo chose to follow the path of autonomy initiated by her father. Her fluency in English opened doors. First teaching at Tashkent’s international school, Muhayo enjoyed independence but wanted more challenging work. After completing an international business course she opened a design and sewing workshop in her mother’s garage hoping to include her sisters in the venture. At the same time, she worked as a cultural assistant at the US Embassy with assignments that included international art events. “Unfortunately, my sisters both suffered domestic violence that is sadly common in my country, and I couldn’t convince them to seek change. I tried to involve them in our business, but their family problems always interfered. 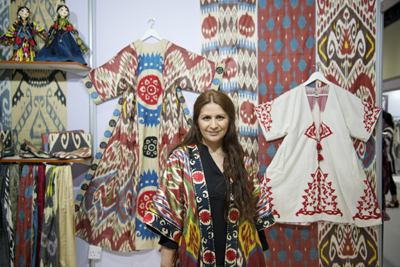 While her passion for design and textiles continued to grow, Muhayo experienced a revelation when she discovered the Western celebration of Uzbek textiles that included extensive museum collections, academic experts, publications and information not readily available in Uzbekistan. 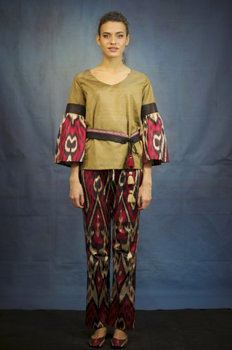 Determined to play a role in reviving and adapting Uzbek textile traditions that were being copied elsewhere, Muhayo applied for and was awarded a grant in 2011 from the Prince Klaus Fund in the Netherlands to produce 20 robes (chapan) based on traditional designs from a catalog of vintage robes. With this, her company Bibi Hanum was formed, named after the favored wife of Amir Timur (Tamerlane). Two years later, the Bibi Hanum line was accepted into the prestigious Santa Fe International Folk Art Market (New Mexico, USA) where she has continued to bring her designs every year since. With growing demand for her line, her sisters unavailable, and a desire to help women, Muhayo saw the opportunity to “do well by doing good” and reached out to form alliances with programs helping women develop skills and economic independence. Muhayo also works with Istiqbolli Avlod, an Uzbek program of End Slavery Now, helping women and girls escape human trafficking, providing training and employment in her workshop. 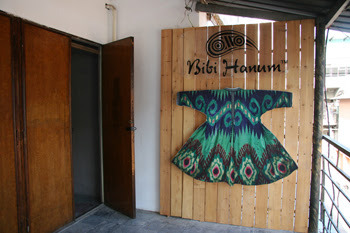 The Bibi Hanum atelier is located adjacent to the Chorsu Bazaar in Tashkent. Phone the atelier before you go, to get precise directions for your taxi driver. Tel: +998 90 947 91 95 or +998 71 200 10 40. In addition to the Santa Fe International Folk Art Market, Muhayo exhibits at shows in New York and Europe. She also sells internationally through her ecommerce website, expanding her fashion line to include home accessories exquisitely crafted with traditional materials and techniques adapted to a modern lifestyle.